We make our base camp near an old military base situated on the high cliffs of the Bay of Sudak's rocky coastline below the looming Mt. Sokil. Surplus Military tents provide lodging and shelter for all our team members and diving equipment. Under the shade of the lodging tent, daily dive briefings keep everyone on the same page and ensure that the directors orders reach everyone in this busy camp. We sleep on cots and cook and store our food in one of the nearby bomb shelters that also doubles as housing for the many artifacts we find everyday. After a day of diving, everyone is hungry and though we have volunteer cooks, everyone lends a hand in preparing dinner for the team. All meals are taken together around a large makeshift picnic table. Watermelon and tea is a real treat for the tired divers. The welcome rest provides time for socializing and getting to know our international colleagues. Artifact conservation, illustration, and recording all take place outside, under the shade of nearby trees. With so much to do, everyone sleeps well even under such Spartan conditions. Our Airline hookah compressor is perhaps our most important piece of equipment for excavation. The gasoline-powered motor drives an air compressor that feeds breathing quality air down four 60-foot hoses to the divers below. With a full tank of gas the machine can run for three hours, allowing three teams of four to work at one hour intervals for a full day of excavation. We would need 12 full scuba tanks to accomplish the same amount of work in a single day. Though we do use tanks occasionally for special jobs, the logistics of filling and transporting that many heavy cylinders are simply beyond our means. The small blue raft is for a support swimmer and for any finds brought back by divers. 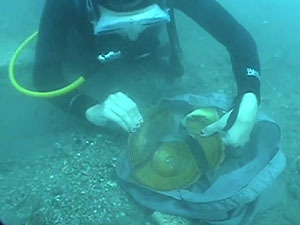 One of our best divers, Nikita Zelenko, excavates a large amphora sherd with intact handles and stopper made from pine bark and resin. He carefully checks the piece for any graffiti markings that would have denoted the ownership or intended destination of its ancient contents. An excellent find, but just one of hundreds of examples that have been found here in Novy Svet. American art student and team illustrator, Chloe Wessner, carefully excavates her first find of the season, a fragmented glaze ware bowl. This piece is an example of the Novy Svet Pottery Group, named after the small tourist town where our wreck is located. 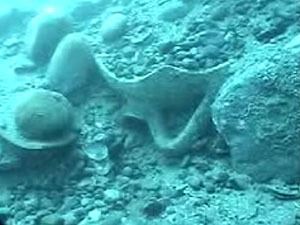 Although other examples have been found in other parts of the Crimea and elsewhere, the wreck in Novy Svet has produced the most complete assemblage yet found and has earned the title. 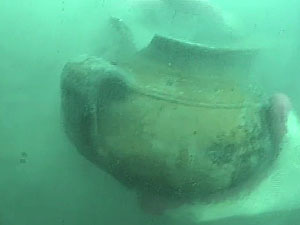 A pot, most likely used by the crew of the ship before it sank, emerges from the sediment. Ravaged by Crimea's infamous winter storms, much of the deposited material from the wreck lies scattered about the seafloor under sand and gravel. Ukrainian colleague Yuri marvels at its excellent condition after being at the bottom of the sea for more than 800 years.